Is Med-Q Programmable Pill Reminder the Best pill box? | Smart Pill Reminder with Flashing LITE-BOX Guides Med-Q Programmable Pill Reminder the Best pill box? Is Med-Q Programmable Pill Reminder the Best pill box? Home ⁄ pill reminder ⁄ Is Med-Q Programmable Pill Reminder the Best pill box? First of all, itis it time to upgrade to the Med-Q Programmable Pill Reminder? is Med-Q the Best pill box? 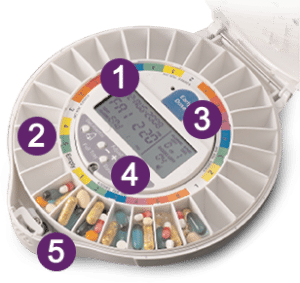 Upgrade your old pill dispensing machine with Lock for Taking Your Prescription Pills that can occur. Especially when hospitalizations or multiple doctors are involved. But the ones above are especially common when it comes to the primary care of aging adults. First of all, get the best pill dispensing machine. Second of all, Recognize your pills. In an ideal world, every older adult would have access to a reliable process for reviewing medications, ensuring that the benefits outweigh the risks and burdens, and monitoring for side-effects and problems. However, as many of you know, our healthcare system is not yet ideal for aging adults. So if you are caring for an older person and want to be proactive about checking on medications. For example, some specific things you can do. Review the Beers List of Potentially Inappropriate Medications for Older Adults. See if your older relative is taking medications on the list. To illustrate, this includes a comprehensive list of “anticholinergic” drugs. Included should be other medications that are especially risky for the elderly. Don’t panic if you discover that an older person is taking a medication on the Beers list. Again, always plan on discussing with the doctor. For example, you’ll want to understand why the benefits are likely to outweigh the burdens, and you can also ask if a lower dose is possible. You can also review “Ten Medications Older Adults Should Avoid or Use with Caution,” authored by the American Geriatrics Society. This document highlights ten especially commonly used medications. Finally, theses can often be stopped or reduced. First, the Right Med in the Right Dose. Second, at the Right Time makes MED-Q the Right Choice. Med-Q Medication Complainant System is the safe, automated solution to medication mistakes. Furthermore, the Pill organizer reminds and guides. Users and their caregivers can be sure in the fact that the smart medication reminder works. To illustrate, meds are taken in the proper dose as well as at the proper time. Available in both Blue and White for two users in the same house hold. The Brilliant Med-Q Pill Dispenser arms greatly improves medication compliance. To sum up, reduces the risk of missed and dosing errors that can be deadly. Under the monitored version, device and compliance information is transmitted to a secure data center which allows caregivers and healthcare providers an ability to track compliance, proactively address dosing errors, ensure equipment functionality and predict refill requirements. Is the Med-Q Programmable Pill Reminder the Best pill box for Loved Ones?